We raise two breeds of sheep; Kathadin and Texel. 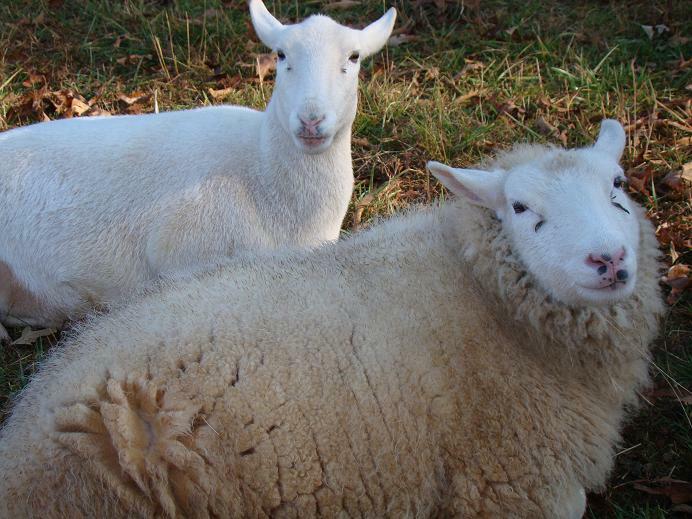 That’s Kat Von Sheep on the left (we named her 2010 lamb Miss Kitty), she’s a Kathadin or hair sheep. Beatrice, a Texel is on the right. Both are meat breeds and we’re keeping these two as breeding stock. Kat is getting a winter coat right now, she’ll shed it over the summer. Kind of like a dog. Lots of sheep farms like the Kathadins because you don’t have to worry about shearing in the Spring. We take our Texels to a neighbor’s farm on shearing day. Local fiber artists come to help out and we have lamb chili for lunch. It’s a long, hard and fun day. Well… the kind of turkey day that ends up with yummy liver and kidney treats for our dogs. We processed our tom this morning, it took a little over an hour and came in at 22 pounds. Jenna snuck up behind us and stole a tail feather to chew on. It was crunchy. Since the dogs got our giblets, I’ll have to just make pan gravy on Thursday. Since we moved to the boonies, I’ve had to learn to make my own pizza. We used to pick up take-out pizza at least once a week and I miss the convenience. A trip to the big city usually means I bring something home for dinner that evening. Yesterday’s trip included a stop at Fresh Market. They just happened to have caviar in the seafood department, they get it in for the holidays. We love caviar and haven’t bought it in like 5 years. The little container was calling my name… When I got it home, I was surprised to learn that the guy behind the seafood counter doesn’t know the difference between caviar and salmon roe because he charged me just $9 and market it salmon roe. Oh darn. Here’s what we had for dinner last night. 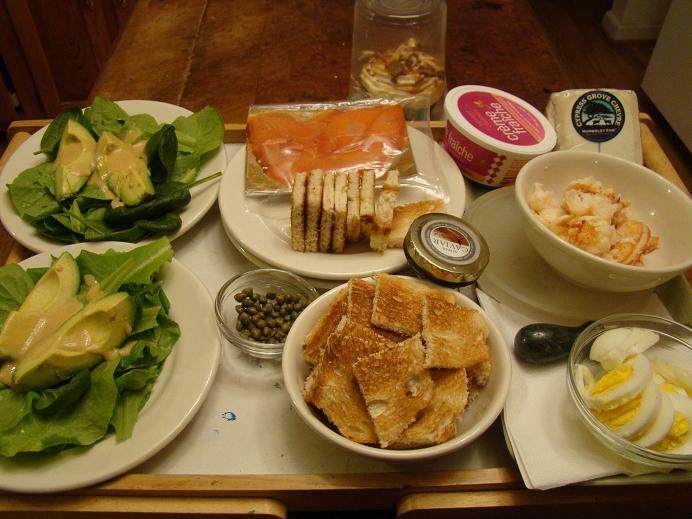 Buttercrunch lettuce & spinach salads from the greenhouse with avocado, toast points with smoked salmon, creme fraiche, boiled egg, lobster (in the bowl on the right), Humbolt Fog goat cheese, capers and caviar. We shared a toffee crunch cupcake (in the back) for dessert. Who says farmers don’t enjoy fancy food?! Today was the final regularly-scheduled market of 2010. We had a total of seven vendors and everyone did really well with the holidays fast approaching. I took soap, sweet potatoes and sourwood honey and brought home cabbage and a ghost pepper which I plan to dry for pepper flakes. It’s the hottest pepper on earth with a million scoville units. We have a ghost pepper plant in the greenhouse but it got a very late start and just now has blossoms. We’ll overwinter it and hope for our own ghost peppers next year. I plan to return to the market next April with asparagus and whatever else we decide to grow for the Spring. The market is a lovely weekly social event. If anyone is interested in purchasing soap, just leave a comment with your contact information and I’ll be in touch. If you know who Bryan Voltaggio is, you either watched the Emmy winning season of Top Chef last year or recognize him from your Williams-Sonoma catalog. He was first runner up for Top Chef 2009, he lost to his brother Michael. Bryan was also a 2010 James Beard award nominee. Our good friend Craig called us at 4PM today to ask if we’d like to attend a 6PM dinner 90 minutes away where Bryan was going to be guest chef for the evening at a small restaurant. That meant we had 30 minutes to get dressed, feed our animals and take the pot roast off the stove that had been simmering for the past 3 hours. Of course we said yes and walked out the door at 4:30 (a record). I even remembered to grab my camera on the way out the door. Since I decided it would be quite dorky to be seen photographing my food, I didn’t use flash but recorded all 5 courses. They’re a little dark. This was our third time meeting Bryan and second time tasting his food. It was worth the drive just to taste his beef cheek lasagna. I’m not sure what arctic char is but my husband sure would like to stock our pond with it. 🙂 We live in a very remote part of the country, but sometimes we get really special opportunities. This was one of them. Are they as bad at your house this time of year as they are at ours? Here’s a trick to get rid of them without using anything harsh. Put a piece of fruit in a glass or jar and stretch a piece of Saran wrap over the top. Secure it with a rubber band. Take a toothpick and punch 8 or 9 tiny holes in the top. 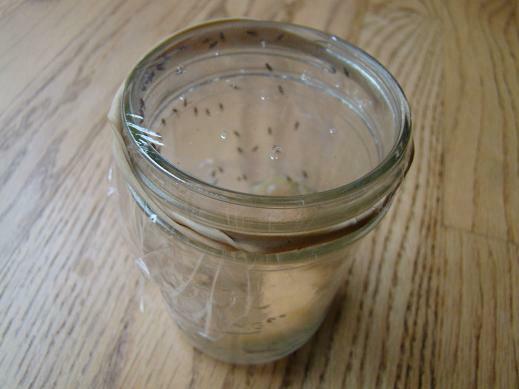 Place the jar near where you’re having a fruit fly problem and just wait. As the fruit decays, it releases an odor that attracts the flies. They crawl through the tiny holes to get to the fruit, but can’t find their way out. Works like a charm! Wow, what a difference a few months makes! We grow the majority of our heirloom tomatoes in pots on our deck, which runs the length of our house. Now that we’ve had a hard frost, the plants are done for. We spent a few hours this weekend moving the pots down to the greenhouse where they’ll spend the winter. It’s weird getting all that deck space back. What’s even weirder is in about 7 weeks we start all over again with planting tomato seeds!